After you’re done, leave the mess with us! Why break your back leaning over the tub, chasing your dog around the yard with the hose or cleaning up that mess afterward? Instead, wash your Fur friend yourself in our Elevated Tubs. Each time you visit our Fur Salon and purchase a Self Dog Wash for your K-9, we will punch your membership card. On your 10th Self Wash we will give you a FREE Self Dog Wash at your next visit. Our way of saying Thank You. 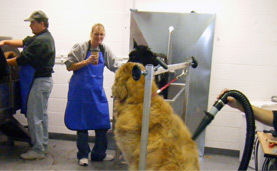 Use of our self dog wash area is on a first-come first-serve basis.